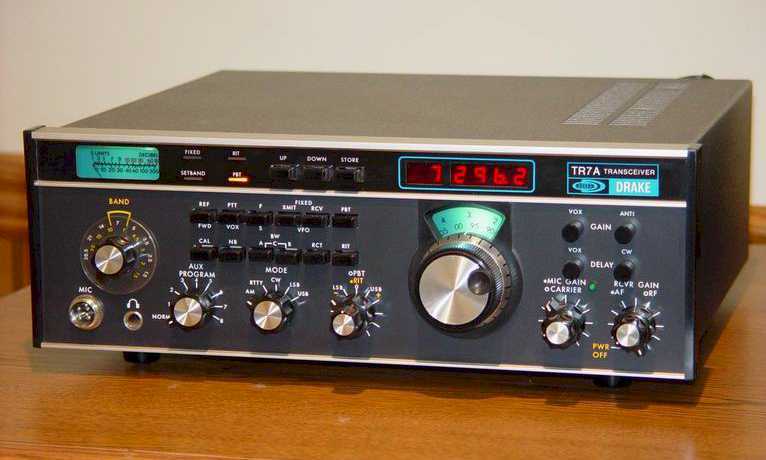 The Drake TR-7 Transceiver, designed by the R.L. Drake Company was considered the first all solid state commercially available transceivers. Being 100% solid state all the circuits were broadbanded so there was no need for preselector tuning or transmitter adjustments across the entire 1.5Mhz to 30Mhz operating range of the transceiver. The high performance frequency synthesizer and the Drake designed PTO provided smooth tuning with a 1Khz analog dial and 100Hz digital readout. The frequency synthesizer provided tuning ranges in 500Khz steps across the operating range of the transceiver selectable with the Band Switch and the "UP" and "DOWN" front panel pushbuttons. Drake was the first to introduce "Up-Conversion" for Amateur Radio transceivers. This was the process putting the 1st IF above the received frequency. Drake put the 1st IF at 48.05Mhz placing image frequencies well outside the tuning range of the receiver. The transmitter was designed to operate at 250 watts input power across the entire operating range of the radio. This netted a typical output power level between 130 and 150 watts on the lower bands and 90 and 100 watts on 15 and 10 meters. The transmitter being all solid state and designed to produce a flat frequency response across the entire operating range required no transmitter tuning or adjustment. The transmitter included VSWR protection which shut-down the power level when the antenna was not properly matched. In the hay-days of Drake before the death of Bob Drake there was much discussion among the engineers on the TR-7. The discussions were on whether the new design should be a tube design, possibly a hybrid design, or forge into the new world of solid state. The more seasoned engineering leaned towards using the "tried & true" tube design. However, after the smoke cleared the younger college grad engineers won the debate for an all solid-state design. During the next couple of year the TR7 design went through several development phases and sometimes into yet uncharted waters. Along the way there were many all nighters, bar-room discussions, ruffled feathers, and impeded territories, but it all eventually came together. During it all, the Drake engineers overcame some insurmountable obstacles like the BFO signal that could be heard a block away until they realized the metal shield was acting like an antenna, or the power amplifier that self-destructed itself with design changes and a little SWR. The basic layout of the TR-7 Transceiver is a modular design. 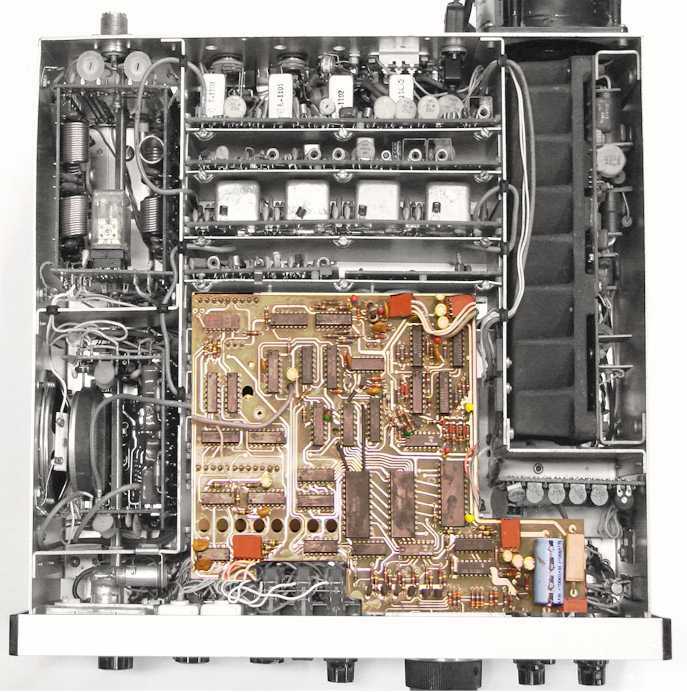 Each section of the transceiver was built on individual circuit boards that plug into a mother board which Drake refers to as the Parent Board. 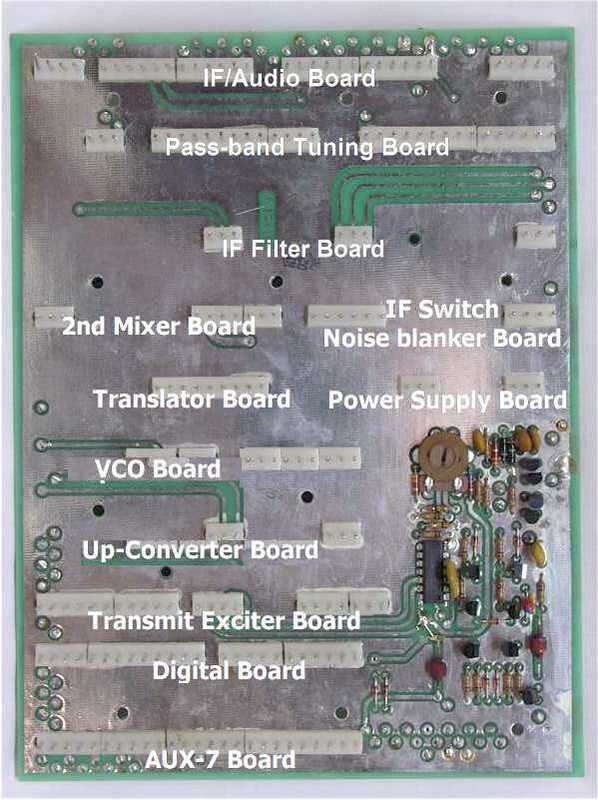 The Parent Board was connectorized to except the smaller circuit boards and interconnect the boards carrying power, switching voltages and low frequency signals between the boards. The high frequency signals used small plug-in coax cables on the top side of the transceiver running between the circuit boards. 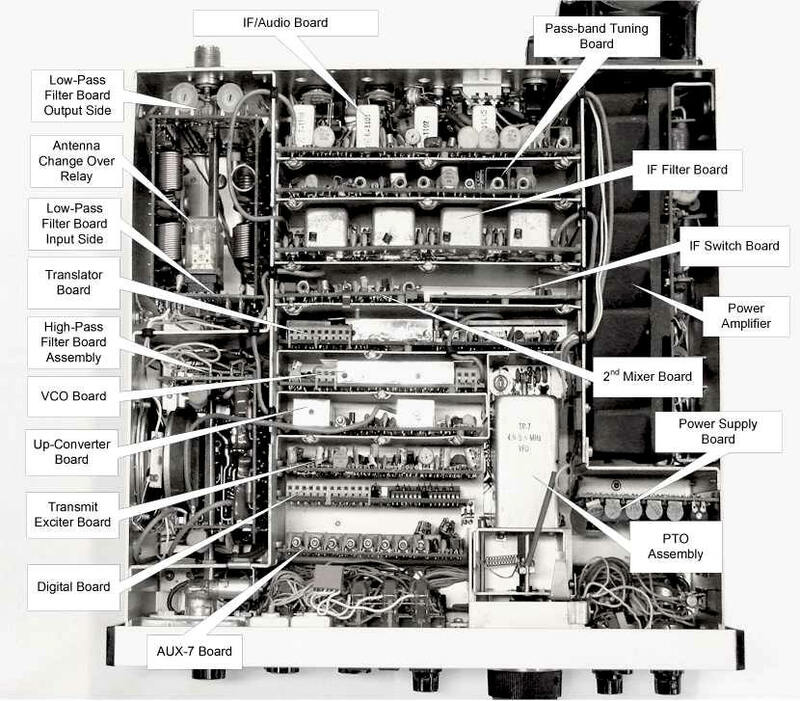 The picture below shows the placement of each board and other major components in the transceiver. You can also see the small coax cables interconnecting the individual circuit boards. When the TR-7 Transceiver was first introduced, the Digital Display Board was an add-on option. After several months of production the digital display became a standard feature with all transceivers. As shown in the picture below, the digital display board mounted over the top of several circuit boards in the front half of the transceiver. The Digital Display Board also had connectors on the bottom side that plugged into the top side of the Digital Board, VCO Board and Translator Board. On the top side of the Digital Display Board there are several small connectors for power and front panel switches. The Digital Display Board had a series of eight holes across the front which was to access the channel trim capacitors on the AUX-7 Board. On the back of the Transceiver there is a switch labeled "Normal - Ext" and a plug-in connector directly under the switch. In the "Normal" position the Digital Display showed the operating frequency of the transceiver. In the "Ext" position the Digital Display Board became an external frequency counter good to 150Mhz. The input connector for the frequency counter function was directly below the switch on the rear panel. The Parent Board, is the transceiver's mother board on which all the other smaller individual circuit board plug into. Detailed below, each of the smaller boards has a particular place where they plug into the mother board. The mother board provides most of the interconnections between the smaller boards including switch and unswitched power, control voltages and signaling. Most of the critical RF signals are interconnected with separate coax cables from board to board. All the front panel controls and functions and the rear panel connectors all connect to the Parent Board along the front and rear edges of the board. The only active circuits on the Parent Board is shown in the bottom left corner in the picture. That circuit controls the RIT offset tuning, the PTO switching between transmit and receive and external devices such as the RV-7 remote VFO.